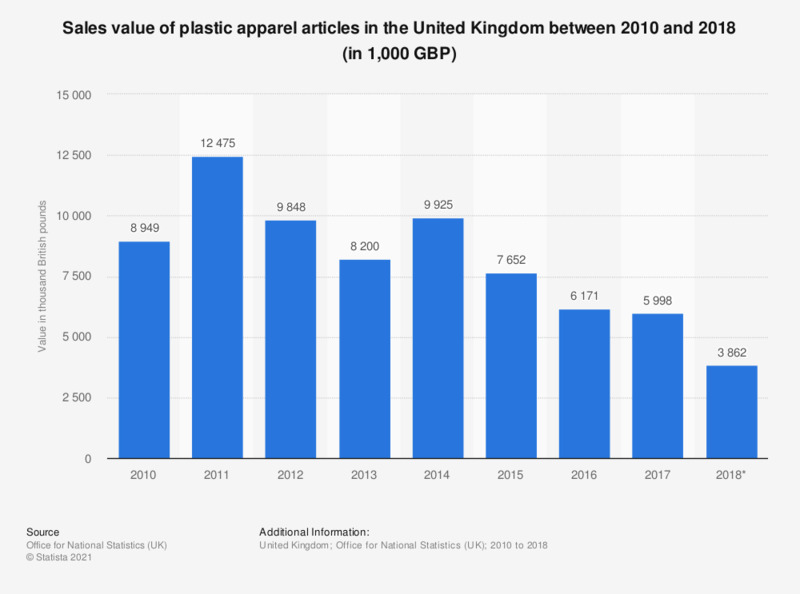 This statistic shows the sales value of plastic apparel articles based on PRODCOM estimates** in the United Kingdom (UK) between 2010 and 2017. The sales value peaked at 12.5 million British pounds in 2011. In 2017, the sales value totaled nearly six million British pounds. * 2017 data are provisional. Plastic articles of apparel and clothing accessories, including gloves, raincoats, aprons, belts and babies' bibs, excluding headgear. Statistics on "Apparel and footwear resale market in the U.S."
Which of these articles have you bought second hand in the past 12 months (no matter if online or in person)? For what reason did you sell the used item? Which of these personal luxury items have you purchased in high-end second-hand store in the last 3 years? Why do you buy personal luxury items (accessories, bags, clothing, shoes, jewelry, watches) in high-end second-hand stores? From which brands are the personal luxury items (accessories, bags, clothing, shoes, jewelry), which you have bought new or used in the last 3 years? Which of these second hand stores specializing in luxury products do you know?